We are bringing our December walk forward to this Sunday December 8th. 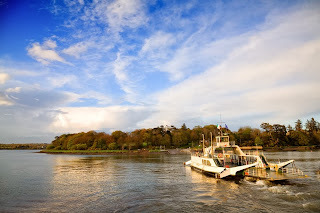 The venue for the walk is part of the perimeter of Little Island where Waterford Castle is situated. Meeting point for the walk is the Ferry terminal at Ballynakill at 1.45 pm and we will cross as foot passengers. Departures are scheduled for every 30 minutes so it is essential that we're all together for the crossing otherwise late comers will miss the walk. Most of the route is on prepared trail but part will be through grass which will probably be wet so footwear accordingly. The Island has many points of interest including wildlife of course with deer frequently seen. Bird life can be extensive and Denis Cullen will have his telescope for those who want to do some birdwatching - lapwing and oyster catcher and winter waders are very likely. Others who want a brisker walk will do that led by yours truly. We will then meet up back at the Clubhouse. We wish to invite members to the Clubhouse for tea/coffee and mince pies afterwards but non members are indeed very welcome to join us. The cost of the refreshments for non members is €4.00. Hope to see you all on Sunday.